Update 10/13/15: Hail to the king, baby! Scream Factory has just released the ultimate, most definitive Army of Darkness set yet! It's a 3 blu-ray set with 4 cuts of the film, an all new 4k scan and all new extras, as well as all the legacy stuff! It's been added to end of the comparisons below, so read on or just scroll all the way down to the new content. Oh boy, here we go. It's about to get real now. I have recently landed the 5-disc Definitive Collection of Sam Raimi's Army of Darkness from Madman, the Australian DVD company. The set has 2 blu-rays and 3 DVDs, and no, it isn't the case where two of the DVDs are identical to two of blus, except for one being in standard def and one in high def. They're all different. 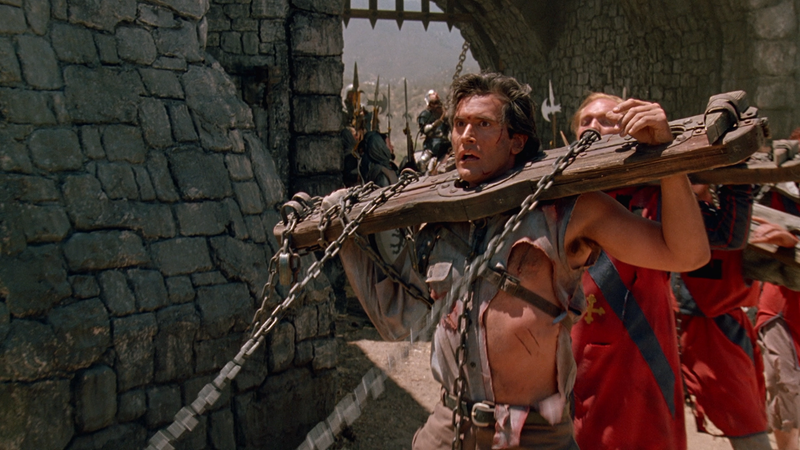 What's more, Army of Darkness is infamous for being possibly the most frequently re-issued film on DVD and blu of all time; and I've got a bunch of other versions on hand. There are a ton of different cuts of the film, sets of extras, and quality of transfers. I've also got info on other releases, including an alternate Ultimate Edition from Germany. Now, the fact that each set has at least a little bit that the other doesn't tells me neither is quite fully definitive; but they've both got more Army of Darkness than even a serious fan will ever need. 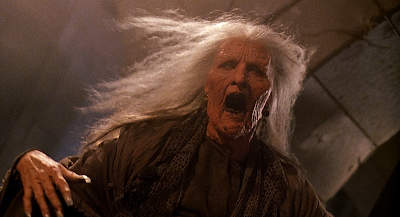 Notice some print damage (on her forehead) in this shot from the US blu-ray. 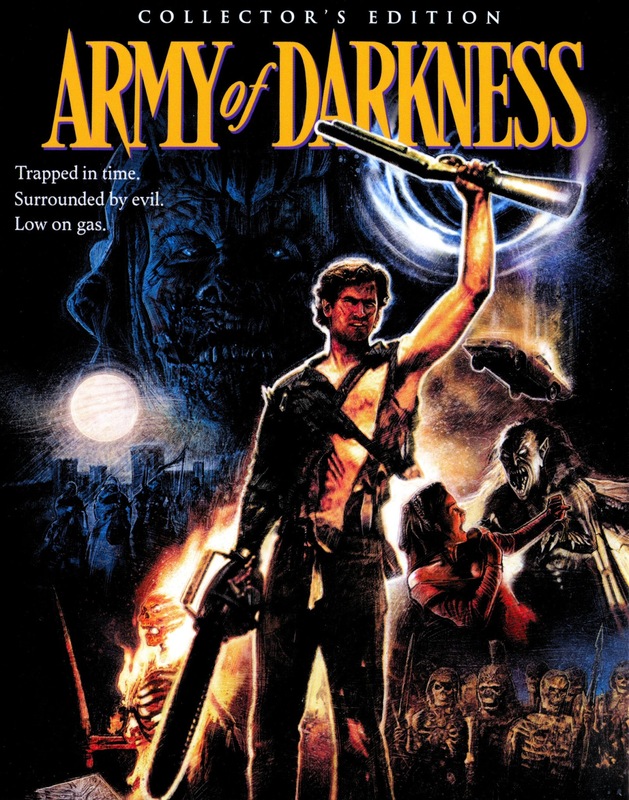 Army of Darkness, of course, is the third - and as of this writing, final - in the Evil Dead series of films, originally meant to be titled The Medieval Dead, and in some markets, unfortunately known as Captain Supermarket. The delightfully ludicrous ending of Evil Dead 2 seemed impossible to follow up, with our protagonist (Bruce Campbell, of course) having opened a portal to send the demons back to their time, centuries ago, but accidentally getting sucked in with them. So we begin with our character taken from a contemporary "cabin in the woods" horror film trapped in the 1300s with knights and kings, still battling the evil dead. Like Evil Dead 2 shifted the tone from the original Evil Dead to be more humorous and crazy, this one shifts the tone even further, to be a bizarre, darkly comic fantasy adventure. And it's one Hell of a good time. Because it was a bigger, and less of a scary, film, the studio seemed to envision a broader audience for this film, selling it not just to Evil Dead fans, or horror fans in general, but to the mainstream market. And so they chose not to market it as Evil Dead 3, and meddled an awful lot in the creative process, resulting in a very short film with an alternate ending and all kinds of changes. Consequently, we have that version, a very different director's cut, and various alternate cuts with missing or additional scenes that were sold in different parts of the world. And it's also been incredibly popular in the home video market. So we've wound up with a whole ton of releases of this film. Anchor Bay in particular seemed to go completely hog wild releasing and re-releasing this and other Evil Dead films over and over. Some editions were completely redundant and unnecessary, but others had real, compelling reasons for fans to up- or side- grade. Which are which? Well, let's compare twelve different versions of this film and start finding answers. Anchor Bay's 1999 DVD, the director's cut. 1.64:1. Anchor Bay's 1999 DVD, full-screen version of the theatrical cut. 1.33:1. These first three shots are all from Anchor Bay's original, limited edition 2-disc set from 1999. Now, this is not the first time the film had been released. Universal released a disc first in 1998. But it didn't have the director's cut, it didn't have any extras. This Anchor Bay set had plenty, and has kept a place in my collection right up to my getting the Definitive Collection. The transfer's not so hot, and curiously in an anamorphic 1.66 ratio (Sam Raimi may've had a hand in that decision, since he's a bit notorious with making creative decisions in the Evil Dead trilogy's early releases). It also has a full-screen version of the theatrical cut, which is pretty unique to this edition, and is at least interesting for being somewhat open matte and therefore showing us more picture in the top and bottom. But it's also pan & scan. Notice how it gives us the full right side of the picture, which even the widescreen director's cut transfer fails to do (it being tragically zoomed in on all four sides), but cutting more of the left side off. This edition also has some great extras, including a commentary by Raimi, Campbell and Ivan Raimi (who joins the proceedings near the end). These guys always do great commentaries, and this is no exception. It's always fun, informative and insightful. And their commentary also carries over to four deleted scenes, which you can watch with the commentary or not. The scenes aren't featured in either cut of the film, and are quite worthwhile. There's also storyboards, the trailer, the original ending (which is already there on the director's cut, but here so you can watch it separately as well), and some bios. Oh, and perhaps most importantly (for reasons we'll come to later), a very good and fairly substantial 18 minute featurette called The Men Behind the Army, which is narrated by Bruce Campbell and focuses on the work of KNB Effects for the film. And while this film was technically "limited" to individually numbered copies, they made 30,000 of them (mine's #16229), so this version is still not too hard to find today. So, like I said, Anchor Bay took a lot of stabs at subsequently releasing this film, like the Boomstick Edition and the Bootleg Edition. Specifically, between 1999 and 2003, they put out four, not counting the original 2-disc set above. That's more than one new edition every year. And the differences were really minor, like one was released just because they added THX sound. Another was a single disc release, and then the Boomstick edition was just them going back to 2 discs again. So some had just the director's cut and some had both; but they all presented them in the same 1.66:1 transfers (technically, the director's cut is more like 1.64). And they all basically had the same extras... but only the original 2-disc set above has that Men Behind the Army feature. For whatever reason, that was an exclusive. But if you read the caption, you already know the screenshot we're looking at here isn't from any of those four Anchor Bay releases, it's from an Anchor Bay UK's release. Specifically, it's the disc from their 4-disc Evil Dead Trilogy boxed set, brazenly labeled "The Definitive Evil Dead Collection." Their treatment of the film isn't any better: it's still the zoomed in, 1.64:1 transfer of the director's cut. It's got the same commentary and deleted scenes, and no Men Behind the Army (even though a previous, 2002 Anchor Bay UK release did include it). But it's a pretty compelling set because it has a bunch of exclusive extras that are only available in this set only to this day. Almost all of them pertain to the previous Evil Dead films, though, so I'll save those details for another post. But one exclusive doc, called The Living Love the Dead, does cover all three films, so a lot of talk is dedicated to part 3. It's pretty poor, though, and doesn't include anybody involved with the making of the film. MGM's 2003 Hong Kong DVD, 1.79:1. Yay! Now we're talking. Anchor Bay stopped putting out DVDs of Army (they were getting a lot of flack for it, plus the rights reverted), and it started coming out from other studios. And this official MGM Studios release in Hong Kong was the one to own! First of all, as you can see, it looks better than any of Anchor Bay's versions. And this isn't the theatrical cut, this is the director's cut. They've got that version without that ugly zoomed in effect. And it's got the most accurate aspect ratio to date. The box claims 1.85:1, but it's more like 1.79. That still trumps all the 1,66's, though, and the picture is so much cleaner and less compressed. Oh, and it's even a little bit more complete than the previous director's cuts, including a shot of Embeth Davidtz's dress being torn that Raimi decided to cut out from his cut for Anchor Bay (though it's in the theatrical cut). To be fair, I can see why he would want to cut it, and it's really not that important... but besides just being generally better for being more complete, the shot is valuable because it makes the subsequent wide shot, where her dress is visibly torn, make sense. In the past editions, the top of her dress just disappears from one shot to the next. The MGM disc also has the commentary, the deleted scenes, the trailer, photo gallery and the alternate ending. 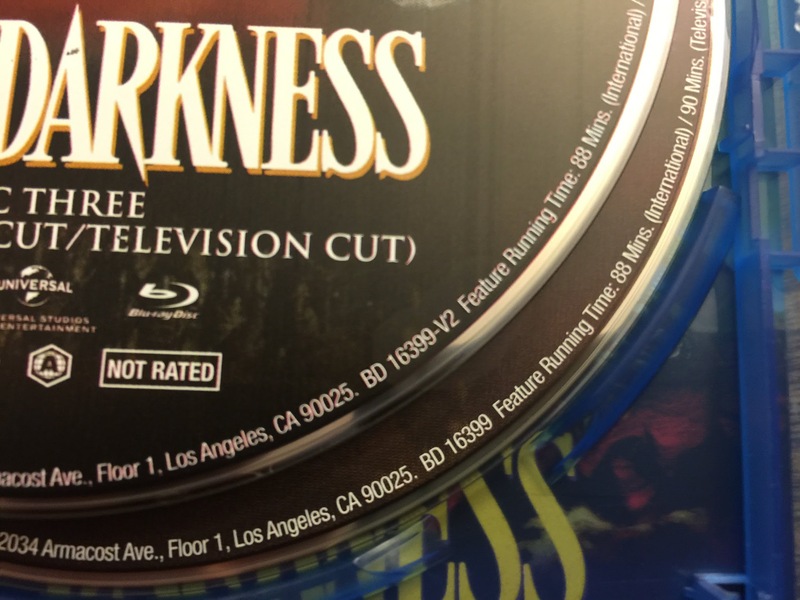 In this case, that ending is the theatrical cut's supermarket ending, because this disc features the director's cut with the original ending. It's just a first class DVD from MGM, that just didn't make it to the US because they didn't have the rights to put it out here. So now we jump ahead six years. Army of Darkness releases were finally dead, even though the US never got anything like Hong Kong's MGM disc. But in 2009 we'd entered the blu-ray age, so it was time to bring Evil Dead 3 back. And who had it now? Universal. So they released the Screwhead Edition from a new HD transfer. I was a late adapter to blus, so I picked up their DVD edition back then. So now I've wound up with the DVD and blu versions of the Screwhead edition to compare, even though they were simultaneous separate releases, not a combo pack. So we get to look at both. And unsurprisingly, they're identical, except for one being in standard definition and one being HD. But even the DVD looks better than MGM's. And it's finally fully matted to the 1.85 OAR. Just one problem, though; Universal has only released the short, theatrical version. So, naturally horror fans have felt a little unfulfilled with this release, despite it still being the only blu-ray edition released in the USA. Madman's 2013 DVD, director's cut, 1:64.1. It has new extras, though, which made me a little happy. Only a little, because there really isn't much. 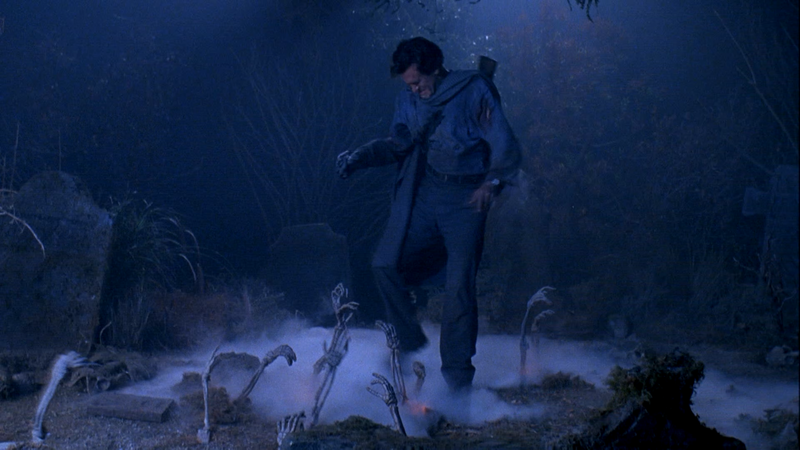 The main thing is a new featurette called Creating the Deadites. This focuses on KNB's work for the film, very much in the same vein as The Men Behind the Army. In fact, a lot of the same anecdotes are told and footage is shown. They're different, though, and they do have some good, unique content, so fans will want to have both. But one is sort of like a remake of the other. And since it was recorded to fit the longer director's cut, the commentary is not on this version, and neither are the deleted scenes. Really, all the Screwhead edition has is the Deadites feature, the trailer, and the original (director's cut) ending, plus some bonus BD Live trailers and a silly "U-Control" thing which makes production photos pop up throughout the movie, if you have the blu-ray version. Madman's 2013 blu, director's cut, 1.78:1. Madman's 2013 blu, theatrical cut, 1.85:1. Madman's 2013 DVD, theatrical cut, 1.66:1. Madman's 2013 DVD, TV cut, 1.33:1. Finally we come to the Definitive Collection, and it's pretty sweet. There's some kinda stuff going on here, though. Two of the discs are the director's cut on blu and the director's cut on DVD. So you'd think they'd be the same transfer, just one in SD and one in HD, right? Nope. Totally different transfers, with the director's cut DVD going back to the old, zoomed in transfer of the old Anchor Bay discs. Weird, but I guess it's preferable to duplicate content... Basically, if you want the old 1.66:1 transfer of the theatrical cut, that's here, on the DVD. 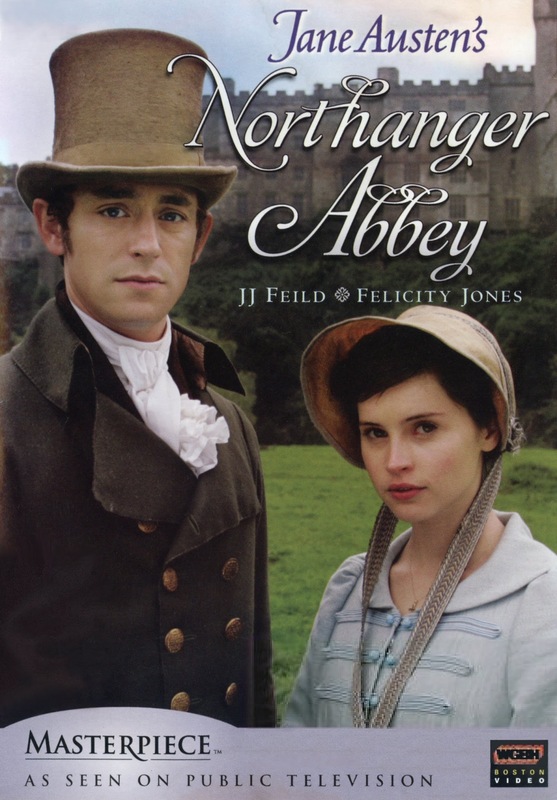 And if you want the 1.85 one from the Universal discs, that's here too, on the blu-ray. That's why this is a Definitive set, folks; you're getting all the options. Madman's 2013 director's cut blu left; MGM's DVD right. The director's cut blu-ray version - the one the majority of us are probably most concerned with - is 1.78:1, like the MGM DVD. And like the MGM DVD, it has the dress tearing scene intact. Now, cynically yet nervously, you may ask, is the new blu really just the MGM disc slapped onto a blu? Happily, no, this is a legit upgrade with an all new transfer of the director's cut. The image is cleaner, the colors are better, and it doesn't have all the SD pixelation it would have if they just took the DVD as their source, and that the MGM does have. This is the best the director's cut has ever looked. 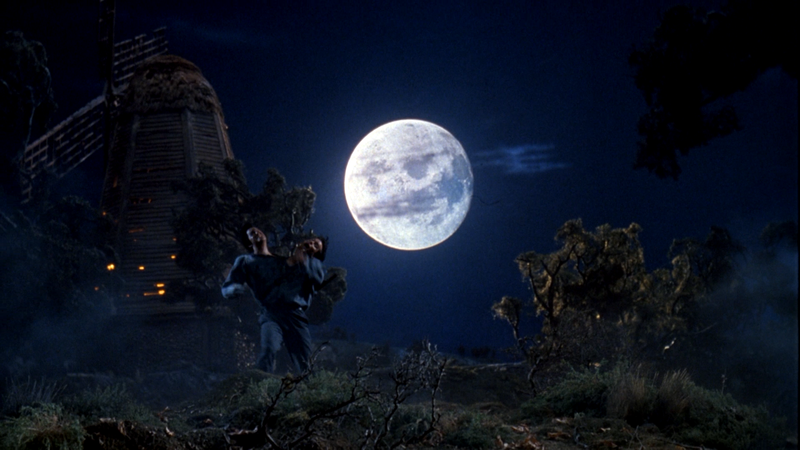 Now, does it look as good as the theatrical version looked on the Screwhead blu? That's debatable, I suppose. The Screwhead edition seems sharper and has more vivid colors, but it also seems to have been tinkered with more in post, using maybe some edge enhancement and unsharpen mask. I'd say the Director's Cut is objectively better. I suspect the theatrical will please many fans, however, while leaving purists preferring the less doctored director's cut. But hey, this set's got the theatrical cut on blu, too; and it's exactly the same as the Screwhead disc. Like, literally, it's the same disc with a new label on it. So you don't have to choose. This set also introduces the TV cut into the mix. It's full-screen and basically matches Anchor Bay's old full-screen framing, but with the brighter colors of the more modern transfers. It's got a little ghost framing going on, though; I guess it came from a PAL source. But it's a TV version, you kinda expect it to look crappy. Anyway, the TV cut is what it sounds like, with lots of language and stuff edited for television, and it's missing some things. But what makes it interesting and worth including, besides maybe the novelty of overdubbed lines being made clean, is the fact that it also includes some deleted scenes and footage not in the other cuts. 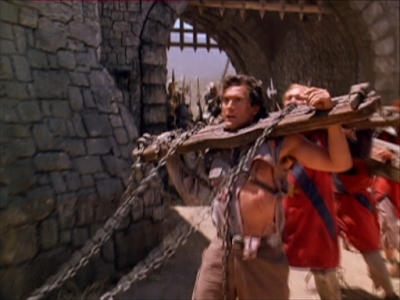 And the scenes are in much higher quality here than they have been on past discs, when they were just deleted scenes, which had all kinds of marks, fading and print damage on them. And extras? It's definitive, baby - it's got everything! Yes, the commentary is on the director's cut, and yes the deleted scenes are here with the optional commentary, too. Yes, Creating the Deadites is on here AND the elusive Men Behind the Army. The trailer, galleries, and even the silly U-Control feature from the Screwhead blu is on here. Oh, and there's more. There's a short, clip-heavy 'making of' documentary, and a series of interviews with Raimi, Campbell and producer Rob Tapert. The 'making of' only features clips from the film and clips of these interviews, though, so if you don't want to watch the same content twice in a row, I'd say just watch the interviews. There's more in the interviews that aren't in the 'making of,' too. Also, the original ending is on here as a separate extra (even though it's also in the two director's cuts, of course), and there are additional trailers. Oh, and it's not listed on the back with all the other extras, but there's also a "Behind the Scenes" featurette made of footage shot during the making of the film. It's short but interesting and noteworthy, because it looked like that was one thing the German Ultimate Edition had that the Australian one here was missing. But, no, it's on here, too; they just forgot to list it. Yeah, the German set. I don't have it, but I've read up on it, so I can explain the differences fairly well. The German set is from Koch Media and actually six discs. The two sets have mostly all the same stuff (yes, their director's cut also has the dress ripping shot), but there are discrepancies. Most notably, the German set has a whole additional cut of the film, known as the International cut, which is kind of a mix of the director's and theatrical cuts, but with some little details that make it unique as well. For me, I had to ask myself, how many times am I going to watch just slightly different versions of the same film? Another cut at this point is just overkill. But obviously some collectors won't feel that way at all and will want that sixth disc; and I totally understand 'em. The German set also has a very brief animated "tribute" extra, which apparently comes from the internet. And they have a nice (German only) booklet. But it's not all Advantage Germany. The con to their set is that they're missing the Men Behind the Army feature. And their DVD transfers are identical to their blu-ray counterparts (besides the SD/HD difference, of course), so you lose out on the 1.66 and 1.64 transfers. I'm not sure how keen fans will be for those, especially in old standard def transfers. But if Raimi prefers the 1:66, that could be a good reason to hang onto those, plus it's definitely Raimi's choice to have the dress tearing scene out of the movie, so the director's cut DVD indulges that as well. So, technically, the Australian set has more versions (5) than the German set (4). The German set consists of 2 blus and 4 DVDs. So they have the same two editions on blu, and both their TV cuts are DVD only, as is Germany's unique International cut. Update 5/23/15: Now Scream Factory has entered the race and kind of killed the debate over the most definitive of the foreign sets. Scream Factory's set is only 3-discs, but all three are blu-rays, giving us the three major cuts - Director's Cut, Theatrical and International - in HD, as well as another low-fi print of the TV cut. It's got fresh, new scans, all new extras and the old ones. It's still not 100% perfect, as we'll see; but it's easily the preferred option out of everything. Scream Factory's 2015 blu, director's cut, 1.78:1. Scream Factory's 2015 blu, international cut, 1.78:1. Scream Factory's 2015 blu, theatrical cut, 1.78:1. Scream Factory's 2015 blu, TV cut, 1.33:1. Mmm, that's an all new 4k scan from the inter-positive on the international cut. 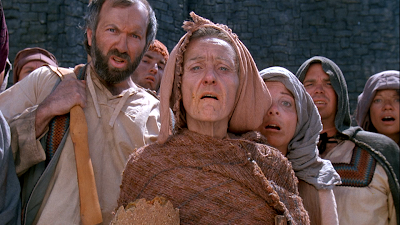 And it mostly is on the theatrical cut, too. Scream seems to have used their 4k of the international cut for all of the footage that's identical in the theatrical cut (which is most of it, after all) and just used Universal's weaker transfer for the missing bits. That's why the two shots above look identical. And the director's cut looks similar to the previous director's cut blu-rays (which was quite good... in fact the best up until this new scan). The back of the case says that the director's cut is matted to 1.85:1; but actually it's at 1.78:1 just like the others. 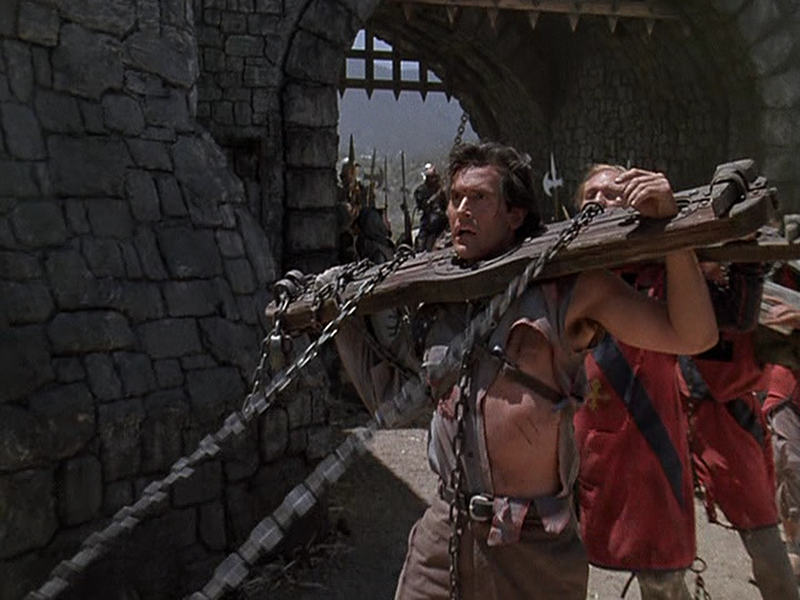 Well, except for the 1.33 TV cut, of course, which looks pretty much like it did on the Madman set except even softer. Scream's director's cut is also a little lower in contrast than Madman's, which brings up the occasional hint of detail in the shadows that was crushed out of the older scan. 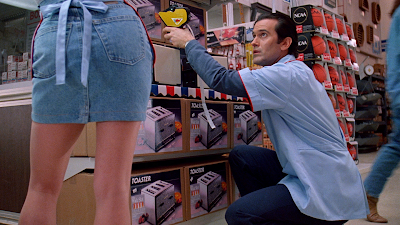 Scream's 4k scan left, Universal's theatrical print middle, and Madman's director's cut right. Getting in close, you can see how this new scan looks even clearer and more defined than the best HD transfers before it. It has the stronger, warmer colors of the previous theatrical cut, though a bit more natural. And it's free of the edge effects and compression junk, giving it the best of both previously available worlds. Still, like I said, Scream's Theatrical cut does still use some footage from Universal's older master. So here we can see that difference in quality, even though this theatrical version does look better than the older theatrical blu-rays. But it's still splotchier, more contrast-y, over saturated and just less natural looking overall than the fresh scan of the international cut. It's also a bit over-cropped, zoomed in to miss a little info on all four sides compared to the new 4k. The 1.85:1 version has similar vertical cropping, without any on the sides. 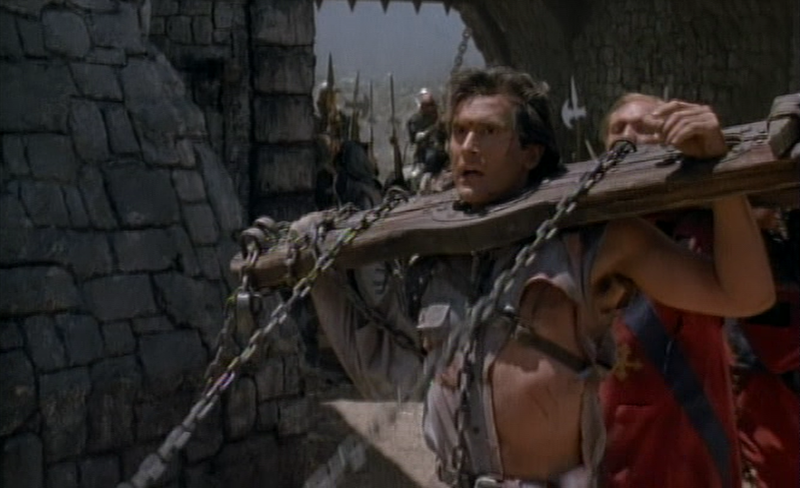 And the colors look a bit more natural, at least (Bruce's face is downright yellow on the older theatrical). ...By the way, considering this shot is in both the theatrical and international cuts, I'm not sure why they didn't use the 4k scan for this shot, too. But, whatever. All three cuts have excellent, DTS-HD 5.1 and 2.0 stereo options (the TV cut just has 2.0), and they each (again, minus the TV version) have optional English subtitles. And extras? Scream has added a brand new, feature-length (97+ minutes) documentary on the making of the film, interviewing pretty much all of the principle players. This far, far, far outshines any of the previous featurettes on any of the past editions. With that said, all those past featurettes are on here, too. Yes, The Men Behind the Army is included here. So is the Creating the Deadites one, the vintage 'making of,' the extended interviews, the deleted scenes with optional commentary, the alternate endings isolated, the audio commentary for the director's cut (that's an important one), plus the multiple trailers and galleries. Basically everything. And remember that short "behind the scenes" footage feature from a couple of the past releases? Well, Scream's blown that out to a 50+ minute collection of KNB's behind-the-scenes footage, which includes all of that plus infinitely more. So that's another pretty sizable addition. shot #1 (left) missing from theatrical cut; shots #2-3 missing from international cut. A few more important details: The director's cut on the Scream set is the more complete one with the dress tearing scene intact. That's great. Not so great, however, is that the theatrical and international cuts are missing a couple brief shots. I can't take credit for this discovery; it's been pointed out on the blu-ray.com forums... but I can confirm that it is present on my retail copy. When Ash is being chased through the woods and comes upon the windmill, the shot where he jumps over a small stone wall is missing from the theatrical cut. And when he's fighting the mini-Ashes inside the windmill, two shots are missing from the international cut. To be honest, I did notice something was off with this scene, but since the mini-Ashes scene is so notorious for being poorly edited in the international cut, I just chalked the choppiness up to that. But apparently, the international cut's scene wasn't that poorly edited, and those two shots should be there. Well, Scream has said they'll address this soon, so we'll see. Update 12/15/15: We've seen! Scream started a replacement program in November. If you bought the set, you can fill out this form on their website, send them proof of purchase in a separate email (yes, even if you're an international customer), and they'll mail you the corrected versions in a cardboard mailer and paper disc envelopes - good show, guys! All of the missing shots mentioned above have been restored. The triple screenshot above was taken from the replacement discs, so that's 100% confirmed. And you can tell the difference between the two discs by looking at the product number on the edge of the disc itself. The new versions have added "-V2" at the end, as shown in the picture above. It's also worth mentioning that Scream's set has reversible cover art, however I actually kept the front one this time, as I actually like their new art - it doesn't have that cheap, independent comic book vibe like some in the past. It also has a slipcover and if you order it directly from Scream Factory, comes with a poster of the same image. And if you order it in October like I did, you also get a free set of horror movie drink coasters. After a little hemming and hawing, I chose the Australian set over the German one because I really wanted to get the Men Behind the Army so I could finally retire that old Anchor Bay set. Little did I know that if I just waited half a year or so, a new champion would enter the arena and let me retire everything. Even after owning the "Definitive Collection," I had to upgrade to Scream Factory's new release. Best transfer, new terrific extras, the legacy extras, all three major cuts in HD plus the TV one. And though it now pales to the new full-length Medieval Dead: The Making of Army of Darkness, it's even got Men Behind the Army on it, too. Very interesting analysis on the various worldwide DVDs and Blu Rays versions of ARMY OF DARKNESS,a ridiculous but fun film that has received as many VHS video and DVD re-releases from Anchor Bay Entertainment as the likes of THE EVIL DEAD,HALLOWEEN,and THE WICKER MAN(the latter film which was certainly treated much better in its various U.S. VHS video and DVD incarnations/releases than it was in its 1979 U.S. theatrical release). Think you made a mistake; Paramount never released Army of Darkness on DVD/Blu-ray. The 2009 releases are Universal. The link to the form in the shout web is not working, could you fix it please? Madman doesn't have the International cut, just the Director's cut (SD and HD versions), the Theatrical cut (SD & HD versions) and the TV cut (SD). If you mean their Director's cut (which is their best transfer), though, you're in luck because several of the unspecified images in this article are from that disc. The first shot of the witch near the top, the shot of the twinned Ash in front of the moon lower down, and the shot of the crowd peering into the pit beneath that one. Thanks for going into such great detail with all these releases! 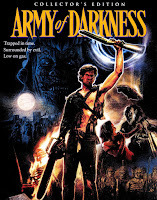 It really helped me realize which one I want to watch when my Scream Factory version of Army of Darkness gets here (I haven't seen it yet, personally, outside of a few scenes). Thanks for the detailed review. I can now toss my R3 HK MGM DVD and pick this up! I just wondering I find here: http://www.dvdcompare.net/comparisons/film.php?fid=1398#15 Optium version. And write this: R2 United Kingdom- Optimum - No Cuts. Full 96:00 min cut of the film, Along with the R3 release, the longest cut of all the releases. And includes the 2 second scene of Evil Ash stripping Sheila which is not on the Director's Cut (92:26 PAL). - On dvd back cover time is 92 min??? is mistake or what? If NTSC is 96 min than PAL should be 92 min? ?